Cube Action Team’s Greg Callaghan was crowned this year’s Irish Enduro Champion delivering a winning performance at Djouce, Co. Wicklow. While the eyes of the world may have been focused on the Pope’s visit further up the road, the eyes of Irish mountain biking were firmly locked on the very first Cycling Ireland National Championships hosted by Gravity Enduro Ireland at Djouce Woods. For the first time a dedicated day of Enduro had been set aside to determine this year’s champions and it was an opportunity for Ireland’s best MTB riders to lay it all on the line. Saturday’s practice session saw the 25 kilometre loop with six stages go down a treat as the only clouds seen were dust ones. However, with the forecast turning sour, Sunday’s racing would tell a different story. Persistent rain hung around until midday leaving the trails wet and muddy, ensuring a testing day in the saddle. With defending champion Kelan Grant out of action, Callaghan was keen to win back the Irish title he last held in 2016/17. However, he wasn’t alone and with cousin Killian having winning intentions of his own, it was clear he’d have a fight on his hands in the Senior Male category. On stage one it was actually 15-year-old pinner Ronan Dunne (biking.ie) who beat everyone for the fastest time. Greg was two seconds slower with Killian a further four back and looking to make up some time. Fastest on stages two and three, Killian provisionally moved into the lead edging clear by about six seconds at the midway stage in the day. Needing to pull out all the stops, Greg set about doing that as the tough conditions wore the riders down. Winning stages four and five to draw level, he pulled the pin on the sixth and final stage to stop the clocks as the overall winner and this year’s National Champion by seven seconds. “Stoked to get this title back and have the green, white and orange with me for the next year,” told a delighted Greg. Despite making Greg work overtime for his new sleeve, Killian had to be content with the runner-up position. With a consistent run of things, Expert Cycles, Scott Wallace joined them on the Senior Male podium for third. Olly Conforth was fourth, with Kyle Lawson edging out Peter Davison for fifth. In the Junior class the battle for top honours was rife between Anthony Dunne (Gravity BC) and Harry Byrne (Expert Cycles). Byrne led after stage one but two perfect stages from Dunne saw him take the lead. Byrne answered back by winning the final three stages, but with four seconds still in hand, Dunne claimed the top step of the podium and the title of 2018 Irish Junior Enduro Champion. Never quite getting into the mix of things, Drew Armstrong (Mech Monkey) had to be content with third this time around. Setting the tone with the fastest time on stage one, Ronan Dunne stamped his authority on the Youth Male class. Storming through for a clean sweep of stage wins, he eased his way to the top step of the podium. Dipping a toe into Enduro, top-teen DH Oisin O’Callaghan was runner-up, with Sean Price (Gravity BC) third. In the Senior Female class, there was no stopping Kona’s Leah Maunsell. Racking up six stage wins, Maunsell proved unbeatable claimed a 94-second margin of victory over her nearest rival Michlle Muldoon (FLOW MTB). Bernie Commins completed the top three. 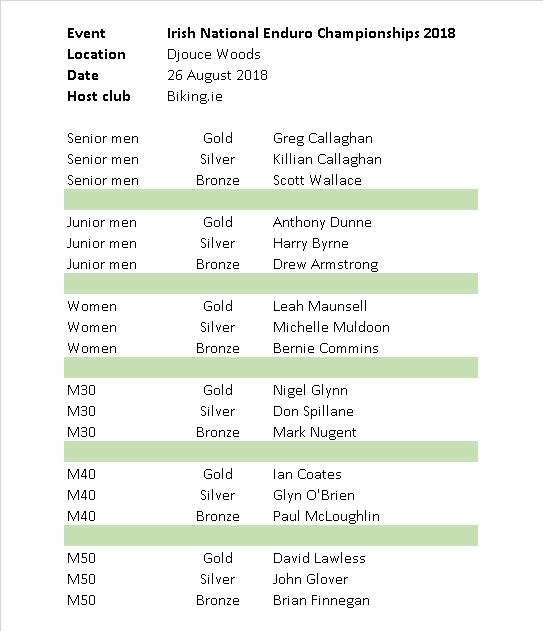 The Masters 30 (M30) was won by Nigel Glynn, Masters 40 (M40) by Ian Coates and Masters 50 (M50) by David Lawless.